Finding friends online is HARD- could today's tech help? 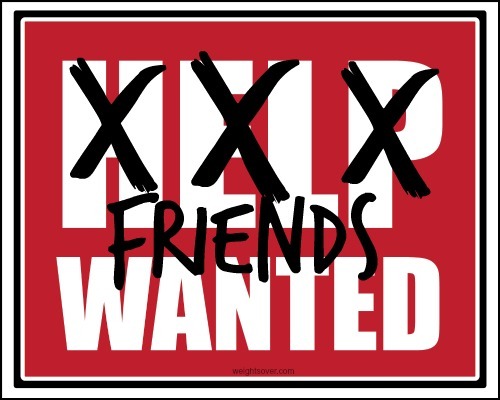 Wanted– Connecticut forty-something, happily married homeschooling mother of two nearly grown kids, seeks female Friends. Should have at least average intelligence and above average wit. Must be willing to receive texts, phone calls, Facebook messages at any time and be able to share support and humor for whatever crisis is current. Must be available for coffee, hikes, shopping trips, workouts, or drinks/dinner out on occasion. Interest in socializing with family, dinners out and home potlucks and pizza delivery nights because we’re having too much fun to cook appreciated. A love of Clean Eating is good, as is the unmistakable desire to simple enjoy McDonald’s French fries on occasion. Must be willing to share a cup of sugar, a cup of tea, or a glass of wine, as well as a hug as the situation calls. Must like cats and dogs, and tolerate cat hair. SAHM’s a plus, but definitely not required. Lover of all things Zombies and The Walking Dead preferable, but not necessary. I do not discriminate based on age, height, weight, race, clothes, bad hair days, face wrinkles, messy living rooms, unruly children, or dirty vehicles. You’ll get a true, honest, real life friend who will always be there for you, to have your back, and is prepared to be a friend for life. Although I live in a real neighborhood with surround by people, there are a lot of days I feel alone. It’s a different “alone” than being stuck at home with little kids. My kids are 16 and 20, and we’re past the point of where “your friends are the parents of your kids friends” stage. The very simple truth is that I am lonely, and I don’t know how to make friends here. Whether its due to the New England mentality of where we live, my role as a stay at home mom, and teacher to my kids, I find myself longing for more friends. As someone who has always been surrounded by friends, and usually makes friends easily, this really upsetting to me. I’ve already decided to try and do more neighborhood friendly things like “Soup nights” or Outdoor Movie Nights at our house to see if that would help us become closer to people, but boy, it would be great to post an ad like this somewhere! In fact, it would be great to answer an ad like that. If you were to write a “friend” as, what would it say? Would you answer such an ad? Maybe you cna’t be IRL friends with Wendy, but you can sure be online friend with her on Twitter and Instagram, and follow her blog, The Wait Is Over.